Immerse yourself into a LEGO® world designed with creativity, imagination, and Brick-Tastic fun in mind. 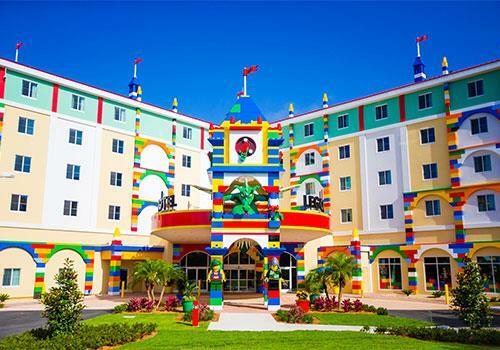 This five-story, 152-room hotel boasts 2000 models built from more than two million LEGO® bricks. Be on the lookout for surprises around every corner at this family-friendly Orlando hotel, including a pool! 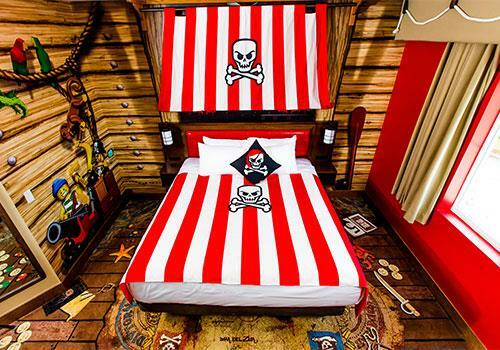 Families can choose from Pirate, Adventure, Kingdom and LEGO® Friends themed rooms. 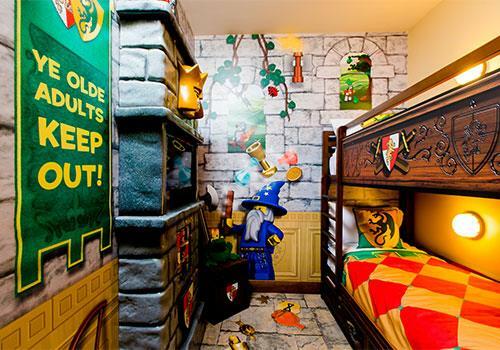 Choose between Pirate, Adventure, Kingdom, and LEGO® Friends themed rooms. Participate in Master Model Builder Sessions and Minifigure Trading. The hotel features nightly LEGO® building competitions. Splash around in the zero-entry, heated pool. Rooms include a treasure hunt for the kids, WiFi, mini-fridge, and 2 HDTVs. 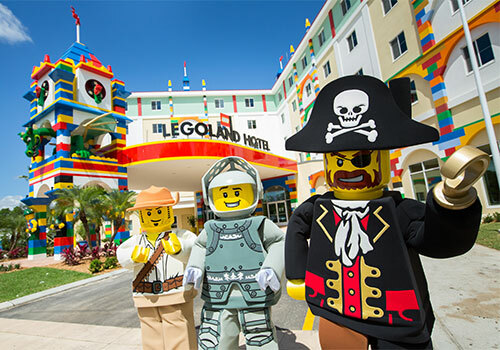 The LEGOLAND Hotel is a five-story LEGO themed hotel featuring 152 brightly colored and highly themed rooms and suites, thousands of LEGO models and interactive play areas. 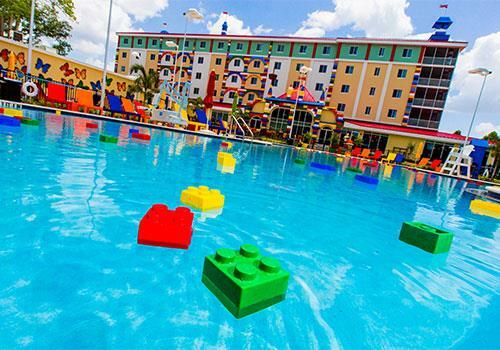 Built for kids, the Hotel gives guests the opportunity to extend their stay and explore LEGOLAND Florida Resort for more than one day. 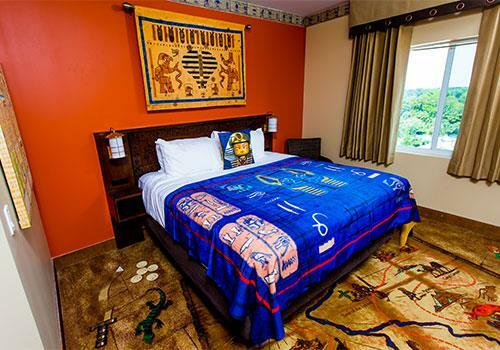 The hotel features four guest room themes: Pirate, Kingdom, Adventure, and LEGO Friends. Each room sleeps up to five, and offers a king-sized bed for adults and a separate sleeping area for up to three children, featuring a bunk bed and a trundle bed, as well as two flat-panel TVs. All rooms and suites feature LEGO models and a treasure chest, which can be unlocked only by completing a hotel scavenger hunt. Guests of the hotel also enjoy free full breakfast daily, interactive play areas, daily and nightly entertainment, disco elevator, resort pool and much more! 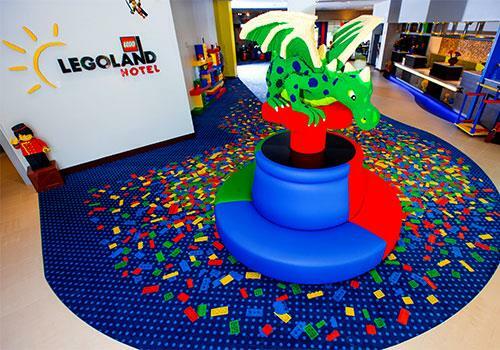 LEGOLAND Hotel offers hotel guests exclusive access to a Master Model Builder Workshop inside the Hotel, where kids can build side-by-side with a Master Model Builder during daily build sessions. Am I charged a resort fee? If so, what does it include? Yes. The resort fee includes self-parking, Wi-Fi access, Master Model Builders Workshop, local calls, access to the swimming pool, pool towels and nightly children’s entertainment. Resort fees are collected at time of booking. Guests can self-park or use valet parking for $20 per vehicle. No. However, Pack ‘N Plays are available on a first come, first serve basis. Availability is not guaranteed. Will my room have an iron and ironing board? No. However, these items are available at the front desk upon request. Does the hotel serve a continental breakfast? The Bricks Family Restaurant all-you-can-eat breakfast, including a selection of drinks, is complimentary to all Hotel guests staying over. Can you view the lake from the hotel? 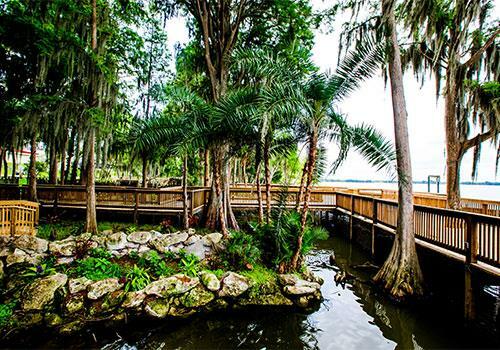 Rooms on all floors do have views of Lake Eloise, depending on which room theme you are staying in. What is included in my overnight stay? A Treasure Hunt in every room, complete with LEGO prizes! The five-story hotel has 152 rooms.